If you know me, you know prayer is an important daily practice of mine. This Children’s Prayer Bible (ICB The International Children’s Bible version) is a beautiful and fun way of sharing prayer with Grandchildren. As a Grandmother, I feel it is important to be prepared when my grandchildren ask about Jesus, my faith, or my prayer time. Sharing my faith with them has been a joy for me. This Bible is an easy way of sharing prayer with grandchildren and other children as well. I even have a Prayer Ministry on social media. For the past year, I have been publishing my art and photography of God’s vast beauty as a Morning Meditation. Early every day, I post a photograph along with a daily Bible reading and my prayerful thoughts on Instagram. On Facebook, I post an artwork of the photograph to my Art as Prayer page and group. In February, I am taking these Live on both platforms each morning. It is what I have been called to do. It is my little way to fulfill my purpose and give my gifts back to God. I have shared my thoughts on prayer in Prayer is Speaking to God, Meditation is Listening and Making Sense of Nonsense. This ICB Prayer Bible translation is specifically written for young children with an emphasis on prayer throughout the Bible. This book is a compelling and unique way of sharing prayer with grandchildren or children of any age. The biggest plus for an artful Grandmother is the prayer journal included with purchase. There is a nifty pocket in the back of the Bible to hold the prayer journal. The best thing is that this beautiful Prayer Bible for Children helps children and grandchildren develop a heart for prayer while learning the Bible. This popular ICB translation is a simple way for children to read and understand the Bible. I especially love that there are special pages throughout the text that highlight the most famous and beloved prayers featured in the Bible. From Abraham’s prayers to the Lord to Jesus praying before his crucifixion, to the way Paul prayed for the churches he planted, this Bible will teach young readers about a God who loves to hear from His children and loves answering prayers. Imagine sharing prayer with grandchildren using this Bible specifically designed for them. And they love the pocket with a prayer journal to record their own prayers. As an added bonus, you can help your grandchildren begin Bible journaling as a prayer practice. Special features include 160 pages of prayer articles throughout the text and 64 four-color pages. 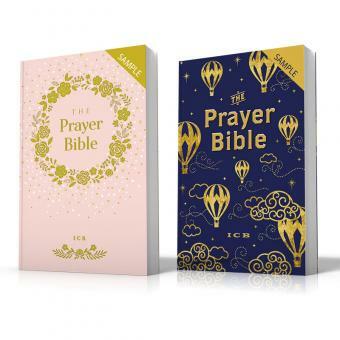 The full page prayer articles will help children learn how to pray, to love prayer, and to see within the Word how and when God’s people prayed. The colorful decorative pages feature kid-friendly scripture prayers, topical poem prayers, and even fun questions and answers kids have about prayer. As a value-add, the Bible comes with a prayer journal and a handy pocket on the back flap to carry the prayer journal. My readers are invited to enter a giveaway at Blessed Freebies for either a blue or pink version. It is open to US Residents who are 18 years or older. The prize has no cash value. Five (5) Winners will be selected on 2/10/2018 and notified by email. HarperCollins Christian Publishing and Frontgate are offering my readers a sample of the book plus a discount code on faith gateway for those who download the sample. Sign up here to receive free samples, 40% off the purchase of ICB Prayer Bible AND free shipping through 3/1/18! Purchase the pink version here. Purchase the blue version here.